After WWII, Micronesia was part of the United Nations Trust Territory of the Pacific Islands. 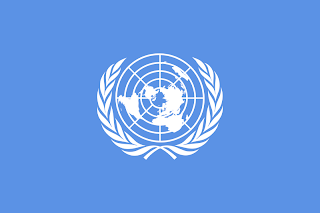 These where islands formally under UN control, but administered by the United States. Prior to being under the United Nations, these islands where all part of the Japanese Empire. 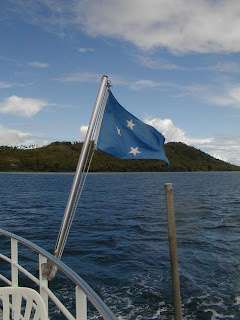 The flag that flew alongside that of the UN was the Pacific Islands Territory. A sky blue field with 6 stars representing the 6 territories that made up the Trusteeship. In 1978, Micronesia signed a Compact of Free Association with the US, and formally withdrew from UN control, and became an independent nation in its own right. The flag that was adopted on November 10, 1979, is light blue, with 4 white stars set like the points on a compass. 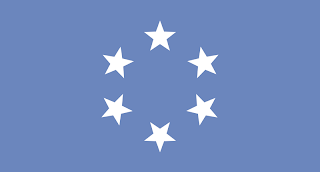 The 4 stars represent the 4 island groups that make up the Federated States of Micronesia, Chuuk, Pohnpei, Kosrae, and Yap. 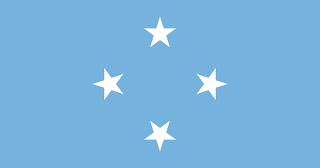 The light blue is both in memory of its path to independence under the United Nations, as well as representing the Pacific ocean.